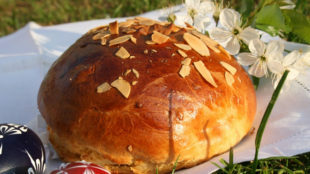 Easter cake or Easter loaf (Czech: mazanec) is baked usually at Easter, from sweet yeast dough, which is also used on the Christmas cake. Baking cakes traditionally took place on Holy Saturday or directly on Easter Monday. Composition cakes previously differed in it, for whom it was intended. For grooms it was made from a common yeast dough, but for the visitor it was enriched with raisins and almonds. Into warm milk crumble the yeast, add sugar, a pinch of salt and a little flour. Leave to rise yeast. In a bowl, mix the flour, add the dissolved fat, egg yolks, yeast, grated lemon zest and nutmeg, raisins (previously soaked in water or rum) and knead the dough. Let the dough rise for one hour. Then knead loaf, which let rise again. Brush with egg and sprinkle with almonds. Bake in preheated oven for about 20 minutes at 200 ° C, then the temperature decreases and bake until golden brown.